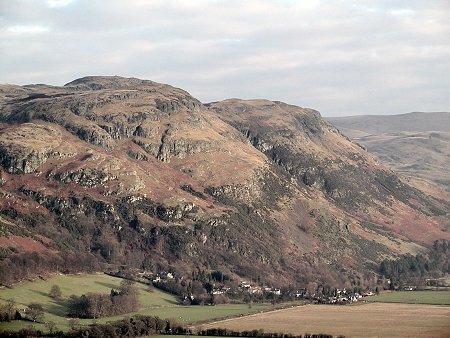 Dumyat is a craggy outlier at the western end of the main range of the Ochil hills. 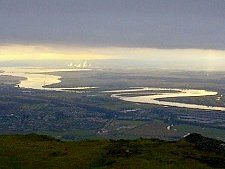 Though only 1,373ft or 418m in height it is a superb viewpoint along the length of the Forth Valley to Edinburgh, the Pentlands and beyond as well as to the south and west. The best route up starts on the minor Sheriffmuir Road above Stirling University. The starting point is just north of where electricity cables cross the road, at Grid Reference NS813980. There is a choice of pull-off places for a car at this point and to the south of it. The route to the summit is straightforward, so long as you take the higher path at a junction fifty yards or so from the starting stile. The total climb is only some 260m, and the distance covered to the top is about 2km. 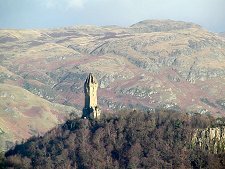 At the top you find a beacon, full of rocks, the usual Ordnance Survey triangulation point, and memorials dedicated to the Argyll and Sutherland Highlanders. You also find the panorama referred to above, which would be the envy of many much bigger mountains. 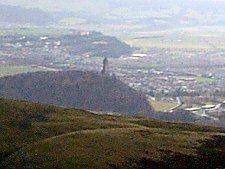 The view down to the Wallace Monument, and to Stirling and the Castle is the highlight, and well worth the gentle climb. 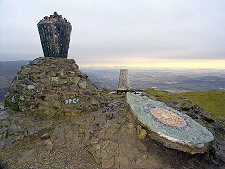 Dumyat is 1,373ft or 418m high. The route involves around 260m of climb on the 2km walk to the top.